From a distance, many wood species look the same, but when you look at specific characteristics, you can start to distinguish the differences between them. Hickory is a very strong, hard wood species that makes it a durable option for a variety of woodworking projects. You can identify wood from a hickory tree by its color, hardness and other distinct features. With more than twelve different varieties, hickory and pecan trees have the highest overall density ratings of all domestic hardwoods, identified by distinctive grain patterns on the surface of the wood. The density and appearance of pecan is so similar to hickory that the National Hardwood Lumber Association will not separate it from the hickory species. The majority of hickory and pecan lumber products are simply referred to as hickory, with no distinction between the different species. Hickory is harvested throughout the Eastern United States where the tall trees display gray hickory bark and a pinnately compound hickory leaf structure. Hickory prices depend upon local availability but are typically mid range and compare similarly to other hardwoods such as oak, ash or maple. The hardness rating of hickory wood sets it apart from other woods and shows just how hard it is. Ranking at 1,820 on the Janka scale, a universal hardness scale that ranks all wood, hickory sits above its nearest domestic competitor, hard maple, which ranks 1,450 on the same chart. Hickory trees produce the strongest wood of any of the North American species. Hickory cabinet doors, for example, feel heavy; when shut, they produce a crisp, high-pitched clunk. Hickory is dense and hard, but it's considered non-durable concerning decay. That's because of its vulnerability to bug attacks. You can recognize hickory by its medium-brown, reddish hue, with yellow or gold highlights. 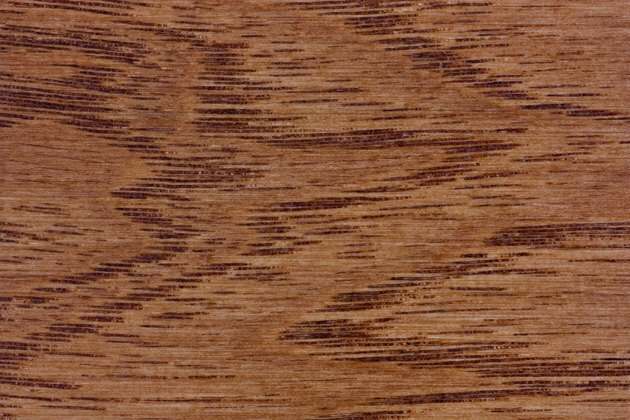 Depending on the wood's grade, hickory may display black streaks or knots. When lower grade hickory, complete with knots and streaks, is used in cabinetry, it takes on a natural rustic appearance that's ideal for homes in country settings, lodges and cabins. High-grade hickory is hand-selected for straight-grain, clear boards. This grade of wood offers a uniform, consistent quality that's ideal for use in high-end homes or businesses. Hickory is somewhat difficult to manipulate. Splintering and blow-outs are common during milling, particularly if cutting edges are dull, as the wood blunts regular steel blades and knives easily. Carbide-tipped blades are vital for clean cuts without chipping or burning. Hickory responds to adhesives as well as other hardwoods, but it's best to predrill for nails and fasteners. Finishing preparation includes sanding with 100-grit sandpaper, followed by 120-grit for a more glassy appearance. Stain enhances the natural waves and colors in hickory, and this species of wood accepts various types of finishes well. High-grade, straight-grain hickory, when finished without stain, has an appearance similar to maple, but with more prominent grain patterns. Hickory is used for tool handles of all kinds because of its inherent strength and resiliency. Axes, shovels, picks and hammers are a just few examples of tools that use hickory wood for the handles. Sporting items include baseball bats, golf club shafts and gymnastic equipment. Hickory withstands the constant impact from slamming and pounding that occurs with these tools and sporting goods equipment. Hardwood flooring offers another application that relies on hickory's durability. It's one of the hardest wood flooring options with less risk of scratches and similar damage. Hickory flooring can often handle the busiest areas of your home because of that strength and hardness.